Click “Link Account” – when you do this, you will be redirected to HDA Cloud’s secure login page. Enter your username and password into the fields. After the account has been linked you will need to Discover Devices. Next click ‘Discover’. This action will communicate with MHUB and pull any devices making them ready to use. Let’s take the command “Alexa, Turn on football” as an example. It might appear like a very simple command but there are a number of things that need to happen in order to watch football! First the TV might need to turn on, but in which room? The volume might need to be set to a desired limit. The correct source input might need to be selected on MHUB and finally that source will need to navigate to the channel hosting the football. You can configure all those actions in what we call a “Sequence”. Inside MHUB-OS we can configure exactly what “football” does. Read more about Sequences and Scheduling. Now you’re ready to go. Take a look at a full list of commands that you can say to your Echo. What is the difference between a HDA Cloud & a HDA Pro account? The HDA Cloud acts as our global data storage and service delivery platform offering an interface for MHUB owners, HDA Pro’s and 3rd party devices to talk to one another. There are two types of cloud account that can be associated with an MHUB system. 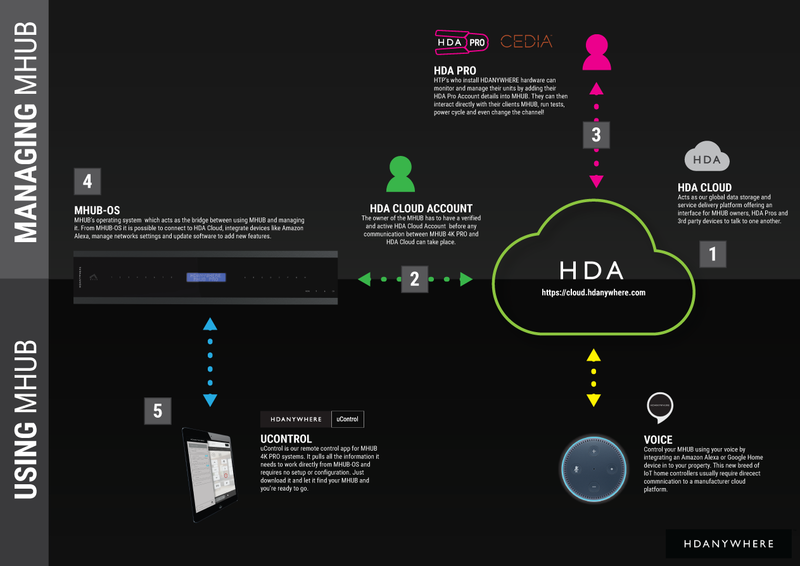 The HDANYWHERE (HDA) Cloud account is the account that belongs to the Homeowner and/or End-User. The owner of the MHUB has to have a verified HDA Cloud account before any communication between MHUB systems and the HDA Cloud can take place. 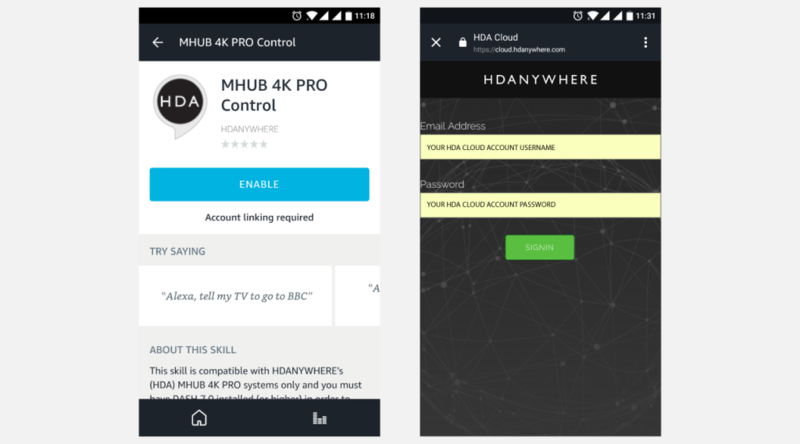 IMPORTANT: a HDA Pro Account has to be created first Here and authorised by HDA staff before the installer can use their account details to enable monitoring on the MHUB. MHUB’s operating system which acts as the bridge between using MHUB and managing it. 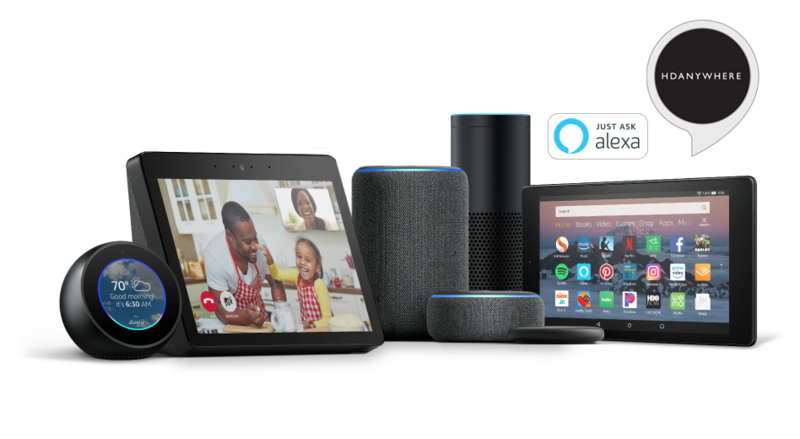 From MHUB-OS it is possible to connect to HDA Cloud, integrate devices like Amazon Alexa, manage network settings and update software to add new features. uControl is our remote control app for MHUB 4K PRO systems. It pulls all the information it needs to work directly from MHUB-OS and requires no setup or configuration. Just download it and let it find your MHUB and you’re ready to go. 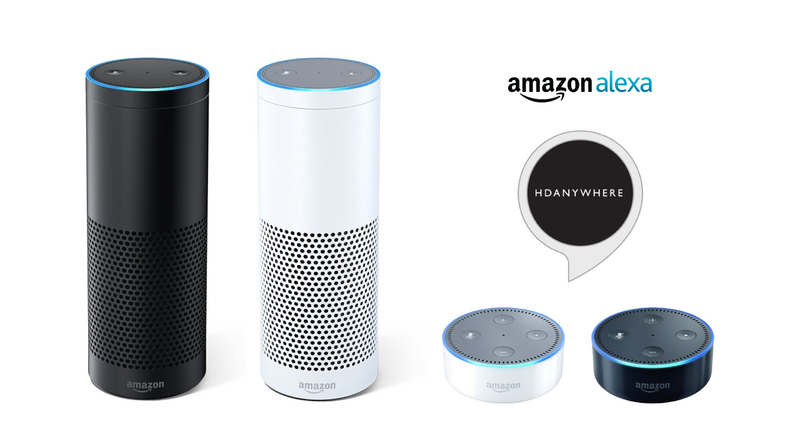 We are assuming that you have already downloaded the Amazon Alexa app and have a functioning Amazon account. There are two types of skill which you can enable on the Alexa app. With a Custom Skill we have full control over the voice interaction (a voice interaction is the communication you have with an ECHO device when speaking a command and also includes the response given by the ECHO) between you and your Echo device, this allows for a greater range of voice commands including playhead, change channel, switch sources, increase/decrease volume.Click here to view a the full range of voice commands. The Smarthome skill differs from the custom skill in a couple of ways. Firstly, invoking a smarthome skill is fixed and defined by Amazon, this also applies to the voice interaction. We currently support on/off commands, allowing you to perform actions quickly by uttering “Alexa, turn on TV” or a custom label like “Alexa, turn on movies”. You can of course, use both. They are FREE! Click “Link Account” – when you do this, you will be redirected to HDA Cloud’s secure login page. Enter your username and password in to the fields. After the account has been linked, visit the “Smart Home” screen then navigate to the ‘Manage devices in Smart Home’ then Devices. Next click ‘Discover’. Let’s take the command “Alexa, tell my TV to watch football” as an example.